This logic probe using NOT Gates is implemented with three NOT gates, one rectifier diode, two LEDs and two resistors. 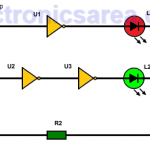 This Two Transistor Logic Probe is a very simple circuit that can be implemented using two NPN bipolar transistors (T1, T2) in a Darlington configuration. This logic probe with 7 segment display is designed with TTL technology and does not use LEDs to display the high and low logic levels found in many of the logical probes on the market. The circuit shows the capital letter “H” when there is a logical “1” or the letter “L” when there is a logical “0”.